Change your thinking about carbs for greater performance in and out of the gym. Every trainer in your gym says it on a daily basis: “As much protein as possible, the more the better! Carbs are the enemy. Don’t go anywhere near them. Keep your fat intake super high to stay full all the time. Count your calories. The only way to lose weight is to keep them under 1,200 per day.” It’s a very simplistic and inaccurate way to look at your nutrition. With so much information on the market about how to eat to ensure you maintain your gains and keep performing well in the gym, it’s tough to know what the truth is when it comes to an effective strategy. The aim here is to give you some simple guidelines to follow when you are doing your meal prep on Sunday night to make sure you are getting the proper nutrients to fuel your workouts so that you keep getting bigger and stronger. We’ve also enlisted some help from Robert Santana, MS, RD, CSCS, a nutritionist, and strength coach out of Scottsdale, Arizona. Yeah, we know that the big dude at the gym who you want to look like tells you that carbs are the enemy, to eat just enough to fuel you but no more, and to perform 90 minutes of cardio a day to burn off what you don’t use. The truth about carbs, according to Santana, is that “carbohydrates are the body’s primary fuel for energy during most activities, [they] have a dose response relationship with the intensity of the activity. As intensity gets higher, carbohydrate oxidation increases. This means as we train more intensely, we burn more carbs.” Basically, the more carbs you eat, the more you are going to burn, as long as your training intensity is high enough, so lift heavy and keep eating. In short, carbs are not the enemy! Yes, fat is more energy dense, but it takes way too long and a much lower training intensity to make fats the primary fuel source that the body uses. That fat burning zone you see on the treadmill chart? There’s some truth to it. At lower training intensities, the body doesn’t need ATP (the fuel for heavy weightlifting movements) as rapidly, thus it’s in the best interest of your body to use fat, which contains the most calories per gram consumed (nine, versus the four found in both carbohydrates and protein). The problem: The intensity of training isn’t enough to stimulate change in the form of gains. Also, without enough carbs in your diet, your body may turn to protein, but again, according to Santana, “proteins are not an efficient energy source.” The takeaway is to make sure you’re consuming plenty of carbohydrates and definitely don’t shy away from sugars and other simple carbs around the time of your workout. Here’s the fun stuff. A common question (and hotly debated topic) around nutritional strategy has to do with fat and protein intake. We all need fat to fill the fat cells in our body to keep us warm, while protein gives us the building blocks of what we need for blood cells, body tissue, muscle and just about anything else in our body. Fat also plays a few other crucial roles. That includes transporting vitamins from the digestive tract into the body to be used in certain biological processes, aiding in brain development, managing inflammation (your body’s response to soft-tissue injury), and playing a role in blood clotting. So taking in fat is important, but not in large quantities. Why? Because when you eat carbs the way we’ve outlined, you get a large spike in a hormone called insulin, which causes fat to be stored. But if you’re not taking in more than you need, you don’t have anything to store! That means insulin, which is an anabolic, growth-building hormone, can be used for gains versus storing fat. What about protein? It’s the source of much debate when it comes to broscience, or what your gym bros tell you works. Lucky for you, we have the truth. But, before we get into that, here’s a quick biology lesson. 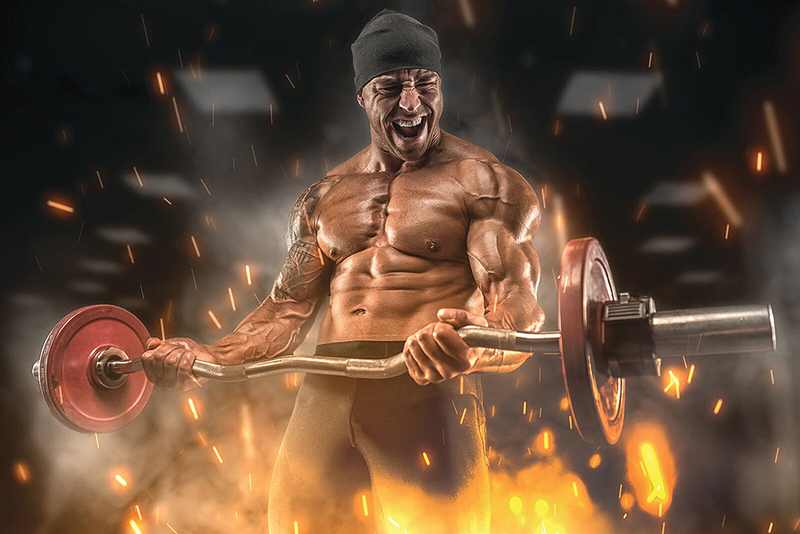 When it comes to building muscle, there’s one really important element: the mTOR pathway. All you really need to know about it is that it’s the single most powerful muscle-building element. Once activated, this pathway greatly increases the rate of muscle protein synthesis (it builds muscle faster than you would otherwise). How do you activate it? That’s where the good news comes in: Everything you do in the gym activates it. Resistance training at a high intensity, drinking that girly-looking pink BCAA supplement, having your protein shake after your workout, everything. More good news: After lifting, your body enters what’s called an anabolic state meaning that mTOR is cranking out protein; testosterone, insulin, and IGF-1 (the main three anabolic hormones) are in high concentration in your blood and telling your muscles to build; and your body is doing everything it can to gain muscle. It’s important to understand, however, that change doesn’t happen right away, so don’t get discouraged if you aren’t Arnold sized by the next workweek. A little more interesting biology coming your way, courtesy of Santana: “branched-chain amino acids are a group of essential amino acids involved in muscle protein synthesis. Branch chained amino acids are leucine, isoleucine, and valine. Specifically, leucine is the most important of the three because it is a major regulator of protein synthesis, which refers to the physiological process of building muscle.” The takeaway is that leucine kicks mTOR into hyperdrive. The more leucine, the better – or is it? Leucine hasn’t been shown in research to have a level at which taking in more becomes toxic, but there’s a point at which taking in more won’t stimulate the mTOR pathway anymore. This point is referred to as the leucine threshold. It’s different for everybody and it is important to play around with your BCAA and leucine intake to find what works for you. Another side note is that leucine is sold in a pure form, and if you want mTOR to crank high all day long, you’d have to take a little leucine with each meal, as well as having it in your pre- and intra-workout concoctions to make sure it stays high to help you recover both in between sets and after the workout is over. The main lesson is that carbs aren’t the enemy, in fact much the opposite. The reason many people restrict carbs and end up being successful in losing weight is because they’re probably eating an 80 percent carb diet, and when the macronutrient balance gets thrown off, insulin becomes the sinister agent of fat storage. The excess carbs that aren’t being used for fuel in the gym get converted to and stored as fat. The second lesson is that protein intake is good, which we knew, but in order to most efficiently use the protein you’ve taken in, make sure you get enough supplemental leucine to rev-up mTOR and watch the gains accumulate. Lastly, keep your fat intake low so you have nothing to store when insulin is high in the blood. Armed with this knowledge, head to the grocery store, stock up on rice and chicken, see the cute girl at the supplement store while picking up leucine and BCAAs, and hit the gym. Happy lifting!